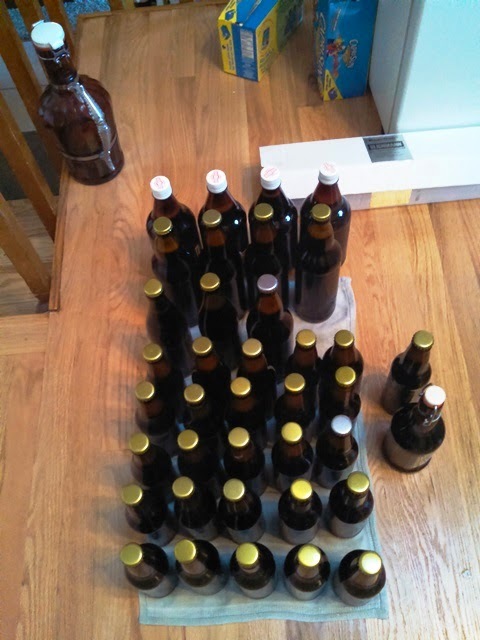 I bottled today SheppyBrew's 2014 X-Mas Ale today. My original plan was to let the X-Mas Ale sit in secondary longer, but when I made that plan, I was forgetting that I need the secondary for adding spices to my pumpkin ale. 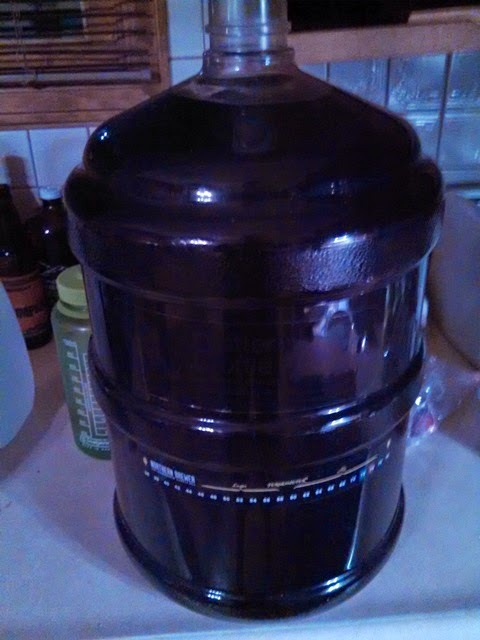 So, I decided to go ahead and bottle today. Have I mentioned that I hate bottling? Hate is probably too strong a word. It is mostly that it is just more time-consuming than kegging. It has been a long time that I've bottled a whole batch of beer, and I had almost forgotten how much more time consuming it is. 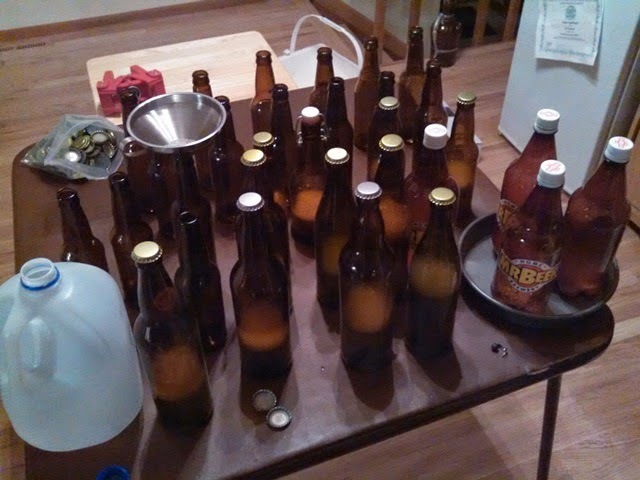 I'm not too sure what the last batch of beer was that I bottled. It might be last year's X-Mas Ale. There are a couple reasons I bottle this beer rather than keg it. The main reason is that it is tradition. I always keep a six-pack of my X-Mas Ales for future vertical tastings, but I could certainly just bottle six bottles rather than the whole batch. Another valid reason is that the X-Mas Ale sits longer than most of my other beers, and I don't want to hold up a keg that long. But, I probably could make something work there. Really, the main reason is tradition. I might think about breaking tradition next year. So, when I bottle, I rack my beer into an empty keg and then use my Beer Gun to fill bottles. This time, something weird happened. About half way through, the little black tip of the beer gun came off in one of the bottles. The tip is what seal the end of the gun to prevent beer from coming out when the "trigger" is not pulled. This is not the first time this has happened to me. Usually, I simply pour the beer from the bottle into another slowly enough that the tip stays behind. I keep this beer, but mark the bottle to drink sooner than the rest because of more oxygenation. I did the same thing this time too, but the tip got past me (I thought) into the second bottle. And then I poured back and forth ... getting more and more confused. Eventually I admitted to myself that the tip had disappeared! It was not in either bottle. I looked through the glass at bottles already filled. Nothing. I looked in the sink thinking maybe I had somehow completely missed it jumping out when going back and forth. Nothing. Not even down in the garbage disposal. Yes, I looked there too. I looked on the table. I looked on the floor. I could not find this stupid little black tip anywhere. 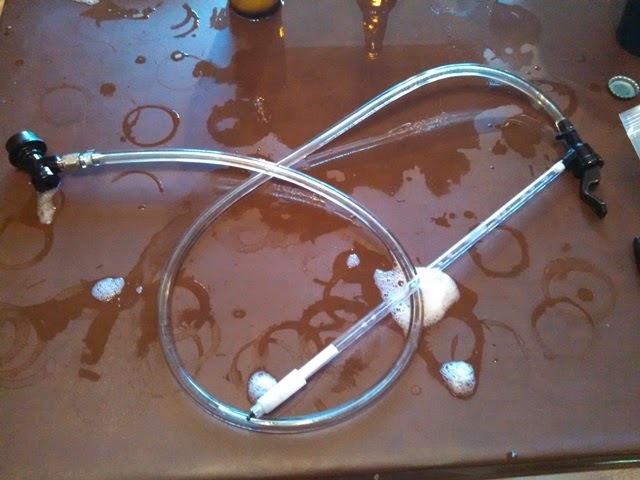 Eventually, I decided to give up and put a bottling wand in a picnic-tap (see the picture above labeled "poor-man's beer gun"). I sanitized this and used it to fill the rest of the bottles. It worked fine. I suspect (if I remember) this is what I'll use next time I bottle a significant number of bottles. After filling the rest, while cleaning up, I finally discovered that the black tip had gotten stuck in the funnel's narrow part. Of course, I feel like an idiot for not looking there. 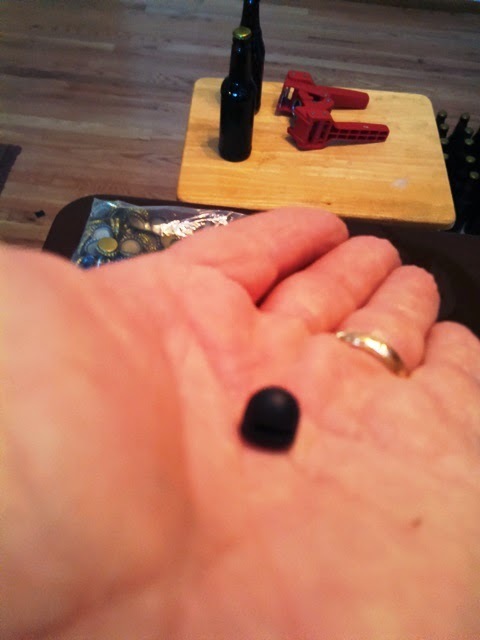 Looking back, that would have been the logical place to look when I discovered it was not in either of the bottles I was pouring back and forth from. Oh well. Sometimes I'm not not that smart. What can I say? And so, I am not as in love with the Beer Gun as I used to be. As I mentioned, this was not the first time this happened to me. This tip is actually a replacement of the original because I thought maybe that would make the tip coming off less likely. The stupid replacement tip was ridiculously expensive for such a tiny little piece of rubber. I will have to write John Blichmann and communicate my disappointment with the gun. But, the good news is that I now have my X-Mas Ale bottled. I got 4 PET liter bottles, 7 bombers, and 29 12oz bottles. In about a month (around Halloween), I'll start sampling. The good news is that the beer tasted fantastic warm and flat. Obviously it will be even better cool and carbonated. I'll let you know for sure around Halloween. I'll probably let you know again around Thanksgiving. And then, of course, around Christmas.